• For quantitative determination of albumin. • Sensitive and accurate. Use as little as 20 μL samples. Detection range 0.3 - 5 g/dL (45 - 750 μM) albumin in 96-well plate assay. • Low interference in biological samples. No pretreatments are needed. Assays can be directly performed on raw biological samples i.e., in the presence of lipid and protein. • Albumin is the most abundant plasma protein in human. It accounts for about 60% of the total serum protein. Albumin plays important physiological roles, including maintenance of colloid osmotic pressure, binding of key substances such as long-chain fatty acids, bile acids, bilirubin, haematin, calcium, magnesium. It has anti-oxidant and anticoagulant effects, and also acts as a carrier for nutritional factors and drugs, as an effective plasma pH buffer. Serum albumin is a reliable prognostic indicator for morbidity and mortality, liver disease, nephritic syndrome, malnutrition and protein-losing enteropathies. High levels are associated with dehydration. Simple, direct and automation-ready procedures for measuring albumin concentration in biological samples are becoming popular in Research and Drug Discovery. BioAssay Systems BCP albumin assay kit is designed to measure albumin directly in biological samples without any pretreatment. The improved method utilizes bromcresol purple that forms a colored complex specifically with albumin. The intensity of the color, measured at 610nm, is directly proportional to the albumin concentration in the sample. The optimized formulation substantially reduces interference by substances in the raw samples. 1. Your company sells two different kit (DIAG-250 and DIAP-250). What are the differences between them exactly? Is it just the wavelength of detection? The two kits use different albumin specific dyes and hence the major difference lies in the sensitivity and wavelengths. Both assays have advantages and disadvantages. DIAG-250 (QuantiChrom BCG Albumin Assay Kit) uses bromcresol green, a dye that is more (about 2-fold) sensitive than bromcresol purple used in the BCP albumin assay. BCG is not absolutely specific for albumin, however, it also reacts with α1- and α2-globulins, and adds a positive bias. The BCP method, although more specific, underestimates albumin in certain samples, e.g. from patients undergoing hemodialysis. If your samples are sera or plasma, which have high albumin concentrations, I would suggest using the DIAP-250 assay kit (detection wavelength 610 nm). If the albumin concentration is low, DIAG-250 is the best choice (detection wavelength 620 nm). 2. Pooled plasma samples (EDTA) show high albumin concentrations with the bromcresol purple assay? What could be interfering with the assay? There should be no significant differences between serum samples and plasma samples. Turbid plasma samples (fibrinogen) can cause high albumin readings. This can be adjusted for by blanking samples at OD 690 nm. BCP does not absorb at 690 nm, whereas the absorbance caused by turbididty is the same at 610 nm and 690 nm. 3. Since the concentration that I am measuring is very low, would it be reasonable to dilute the standard curve down to lower level so my sample is still within the curve? Yes, as long as the standard curve is within the limits of the dynamic range, but this will not increase the sensitivity of the assay. To increase the sensitivity add a larger volume of sample and standard. For example, you could add 20 μL sample and 20 μL of diluted standards (instead of starting at 5 g/dL as shown in the standard protocol, start at 1 g/dL). 1. Maier, SM et al (2007) Proteinuria of Nonautoimmune Origin in Wild-type FVB/NJ Mice. Comp Med. 57(3) 255-266. Assay: Albumin in Mouse urine, serum (Pubmed). 2. Yung, S et al (2009). Anti-DNA antibody induction of protein kinase C phosphorylation and fibronectin synthesis in human and murine lupus and the effect of mycophenolic acid. Arthritis Rheum. 60(7):2071-82. Assay: Albumin in Human urine (Pubmed). 3. Sharifuzzaman, SM and Austin, B (2010). Kocuria SM1 controls vibriosis in rainbow trout (Oncorhynchus mykiss, Walbaum). J Appl Microbiol. 108(6): 2162 ? 2170. Assay: Albumin in Fish Trout serum (Pubmed). 4. Kelly, E et al (2011). Redistribution of labile plasma zinc during mild surgical stress in the rat. Transl Res. 157(3):139-49. Assay: Albumin in Rat plasma (Pubmed). 5. Shin, SY et al (2009). Local production of total IgE and specific antibodies to the house dust mite in adenoid tissue. Pediatr Allergy Immunol. 20(2):134-41. Assay: Albumin in Human blood (Pubmed). 6. Shin, SY et al (2009). IgE response to staphylococcal enterotoxins in adenoid tissues from atopic children. Laryngoscope. 119(1):171-5. 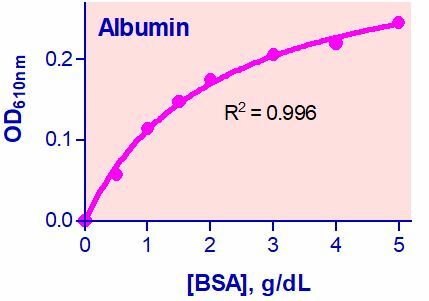 Assay: Albumin in Human serum (Pubmed). 7. Shin, SY et al (2009). Immunological investigation in the adenoid tissues from children with chronic rhinosinusitis. Otolaryngol Head Neck Surg. 141(1):91-6. Assay: Albumin in Human tissue (Pubmed). 8. Olsen, AS et al (2010). Limb regeneration is impaired in an adult zebrafish model of diabetes mellitus. Wound Repair Regen. 18(5):532-42. Assay: Albumin in Zebrafish blood (Pubmed).